Paste Email allows you to paste your email address (and more) to any text input field. Access is made through the context menu (right click), and the toolbar. You may store email address, cc numbers, passwords, tracking numbers, and any other long and/or awkward text you have to type frequently. Paste Email allows for up to 15 stored textlines and has a simpler user interface. 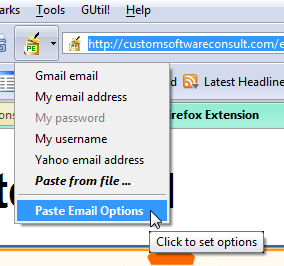 Paste Email Plus allows for an unlimited number of textlines , encryption for password fields and date/time meta tags. If you're like me, you visit many webpages that prompt you for your email address to access the page or to sign up. My email address is particularly long (32 characters) and I'm no speed typist. I've often wished that there was a function key I could press that would paste my email address wherever I needed it. TIP: Clicking the toolbar icon will paste the last pasted item or (with Paste Email Plus) a default item of your choice. Questions, concerns, comments? Post them in the support forum. Fix for context menu item disappearing when right-clicking on non-text field and not re-appearing when right-clicking on text fields. Rewrote all code to conform to current Mozilla standards. Added icons to toolbar and context menu dropdown lists. Same as v2.1.2 version, but compatible to Fx 3.0b*. Locales: en-US, es-ES, es-AR, de-DE, fi-FI, fr-FR, he-IL, it-IT, pt-BR, ru-RU, sk-SK. Locales: en-US, de-DE, es-ES, fi-FI, fr-FR, he-IL, it-IT, pt-BR, sk-SK. en-US (English) locale only. New locales will be added as they become available. Check back here for the latest version. Save and paste up to five different textlines. You can store email address, credit card numbers, passwords, tracking numbers,etc. Language support for en-US, fr-FR, es-ES, and fi-FI. Please report bugs in the support forum. "Compatability mode" is now more lenient. Works better with gMail. Entering of pastetext and categories is now more efficient. No need to "Save all" before exiting options windows. Added 'Create pastetext from selected' and 'Create pastetext from clipboard' menu items to the toolbar, statusbar and context menus. Not compatible with Fx 21 as previously stated. Fix for re-displaying pastetext items when re-ordering the position. Import/export pastetext items. Useful for business installations where multiple users use the same pastetext. en-US locale only until translations are complete. Sound options: Disable all sounds, select custom sounds. Fixed problem with "Save all" and "Cancel all" not appearing in PEP options window on *nix and Mac platforms. Pastetext may be assigned and sorted into categories. Can import previous Paste Email and Paste Email Plus data. Add, change, delete operations more intuitive. Only en-US locale. More to come. Discuss, complain, praise or request in the forum. Comments (good, bad or indifferent) are sincerely welcomed. So far, visitors have wanted to learn more about this extension.